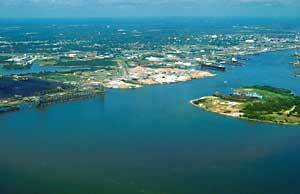 Alabama is the 30th largest state in the United States with 52,423 sq. mi. of total area. 3.19% of that is water, making Alabama 23rd in the amount of surface water, also giving it the second largest inland waterway system in the United States. National Parks include: Horseshoe Bend National Military Park in Daviston; Little River Canyon National Preserve in Fort Payne; Russell Cave National Monument in Bridgeport; Tuskegee Airmen National Historic Site in Tuskegee; and Tuskegee Institute National Historic Site near Tuskegee. Birmingham likes to refer to itself as the Magic City. To add a touch of magic to your travel plans, get ready to experience this truly southern city. Birmingham welcomes its visitors with an array of things to do and see. Regardless of the season, and all of them are mild, there are activities, attractions, sports, entertainment and dining for even the most seasoned traveler. Located 140 miles west of Atlanta, in the foothills of the Appalachian Mountains, Birmingham holds the honor of being Alabama’s largest city. Arlington Antebellum Home and Gardens is Birmingham’s only antebellum mansion (the city was founded after the Civil War). Birmingham’s McWane Center focuses on science, technology and the environment. Visitors can interact with the many hands-on exhibits and see a movie in the IMAX theater. The Alabama Jazz Hall of Fame honors jazz greats who have ties to the state and tells the story of jazz from its beginning to the present. Located on the Alabama River in the center of the state, Montgomery is a thriving city with an impressive amount of history and distinctly southern style of living. The city is filled with culture and history, but the passage of time is gracefully slow and easy, in the southern style. Montgomery is a cosmopolitan city. From its famous Shakespeare festival to its symphony orchestra to the F. Scott Fitzgerald Museum, there are activities of substance that are culturally significant. The highlight of the year in Montgomery is Jubilee CityFest which takes place during Memorial Day Weekend. CityFest appeals to a diverse crowd by offering the best of just about every genre of music including pop, country, alternative, zydeco, blues, jazz, folk, gospel, oldies and classic rock. Other Jubilee CityFest attractions include KidsFest, ArtFest, Symphony Pops Concert, Jubilee Run, “Thunder Over The River” fireworks and a Sunrise Celebration Service. It is easy to see why Montgomery is such a popular vacation destination at any time of year! The 70-acre Alabama Adventure (formerly VisionLand) Theme Park in Birmingham has thrill rides, a water park, a children’s area and an amphitheater. Its featured rides are the “Rampage,” one of the nation’s fastest and largest wooden roller coasters, “Zoomerang,” a steel “boomerang” coaster, and “Space Shot,” a 185-foot launching tower.